Despite the fact that there's a Kre-O Predaking box set, it only contains four Predacons. You could find a fifth, however, in the first series of blind-bagged Micro-Changers. Rooooooarrr! I don't have time for you! I'm too busy shredding things with my claws and blasting Autobots with my lightning rifle. Raarrr! I hate talking! Why do I have to talk to you? Why can't I just go outside and destroy something?! Hobbies: Clawing things. Pouncing on things. Likes: Jumping. Running. Destroying stuff. Favorite restaurant: Anywhere that serves raw meat. Isn't that cute? 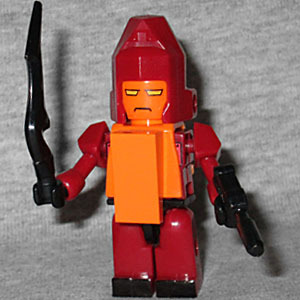 Kre-O Rampage lives up to the description of his G1 counterpart. For whatever reason, they've decided to make him mostly red, with a bit of orange sticking off his chest; in reality, those colors should be the other way around. The red arms and legs are fine, as are the black feet, but the rest is kind of picked at random. He has two yellow eyes, but they're on an orange face with a frowning mouth, not a yellow face with a mouthplate. Beneath the brick on his chest is a painted version of his beastmode head and the metal plates that flank it - why don't we get to see those? Turning Rampage into a... tiger(?) is not complex: you merely bend the robot at the waist so he's on all fours. Okay, you have to flip his vest around, too, so the orange bump is now on his back rather than his chest, and you plug the two included guns into the sides of his legs, but getting from one mode to the other is in no way difficult. His beast head is just a generic "animal" shape, rather than attempting to actually look like a cat, so they can reuse it for as many Kreons as possible. Nothing is done with his jagged sword. If this were the only Predacon available, I probably wouldn't have gotten him - and it's annoying that he doesn't get to be part of Predaking. But you can build him into the set if you want, and the team looks great when they're standing together complete.